In today's business environment, it's essential for companies to harness strategies and technologies that ensure their operations facilitate long-term growth and success. Last week, AT&T announced future plans for significantly reducing its carbon footprint and moving toward greener management practices, emphasizing a specific focus on transforming supply chain sustainability. The company's goals were explained in its recently published white paper, "Connect to Good: Roadmap to 2025." "Connect to Good represents our company's vision of using the power of our network to build a better tomorrow," AT&T Senior Vice President Charlene Lake said in the statement. "Our technology will guide us as we work with our employees, customers, suppliers and communities to fulfill our goals." The white paper indicated that the telecommunications company intends to establish itself as an industry leader in sustainability metrics, sourcing and performance. AT&T's citizenship and sustainability strategy implies that, by amplifying the use of innovative technologies, it will be able to improve network efficiency, create low-carbon customer solutions and enhance supply chain technology with strategic suppliers. "We want to work with other companies and experts to create a methodology for measurement, especially regarding our carbon savings goal," Jenny Robertson, AT&T's director of sustainability, told Sustainable Brands. "We are looking to make an impact beyond our own company. That's part of why it's a long-term goal, and an exciting challenge since nothing like it exists yet. We also know that a methodology built on industry expertise and stakeholder consensus is more meaningful than what we can produce on our own. It helps ensure apples-to-apples measurements and fosters collaboration." According to its report, AT&T already uses an annual Sustainability Scorecard to evaluate suppliers on environment and social factors. In 2014, the average score was over 70 percent, which the company said it plans to exceed by at least 10 percent in 2017. In an effort to cut greenhouse gas emissions, AT&T will work with strategic suppliers that have already initiated sustainable practices. It will also base at least 80 percent of its sourcing decisions on sustainability performance metrics. 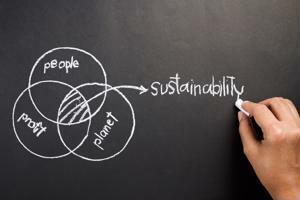 The company's white paper explained that these goals were fueled by findings from the Global e-Sustainability Initiative's SMARTer2030 report, which proposed that the use of information and communications technology could reduce carbon emissions by 20 percent. Additional long-term goals mentioned by the white paper included requiring the AT&T fleet to use alternative-fuel vehicles, increasing customers' access to technology, closely tracking, monitoring and measuring performances, and collecting and recycling more than 20 million devices by 2020.